Forgive my obsession with sewing since I learned how to sew, yet more obsessive has been my search for a sewing machine. Friday: Looking for sewing machines on ebay. So many models and brands, so little knowledge. Saturday: Hours spent reading the features and conditions of each of the 26,786 machines available on ebay USA. Sunday: Lost three bids for a Pfaff, and two Singers. I learned that good sewing machines are expensive even if they are used and made in the 70’s. Monday: Read about the main brands that manufacture sewing machines. Brother, Singer, Kenmore, Janome, Husqvarna Viking, good old Pfaff, and started moving towards Janome and far from Brother. Sent an e-mail to my mum asking her for advice (even though she doesn’t sew) and learned from her that she had a sewing machine that had not been used in 15 years, went over to her place, undusted it and found a beautiful Kenmore 1803. The motor worked, but the machine did not work. I took it to Sears to get it serviced and am currently crossing fingers to see if it is fixable and useful. 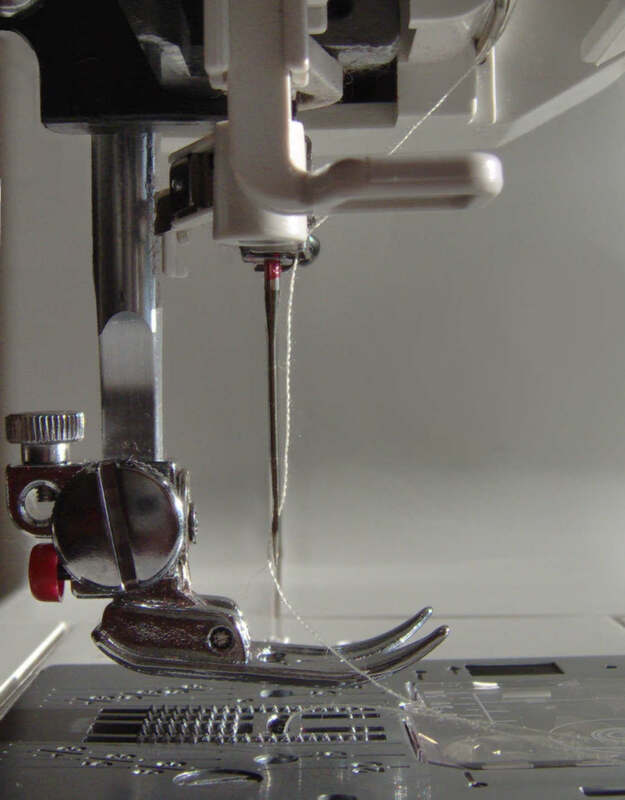 Tuesday: Read about the sewing machine and developed a respect and deeper desire for it. So here I go with today’s literature extracted from wikipedia and The Museum of American Heritage. The sewing machine was first patented in 1791 by British cabinet maker Thomas Saint who was in search of a machine that sew leather and canvas. In 1814 an Austrian tailor, Josef Madersperger, introduced his first sewing machine. The development of this machine began in 1807. In 1830 a French tailor, Barthélemy Thimonnier received a patent on a sewing machine that sewed straight seams using chain stitch. By 1841 he was successful in having eighty machines sewing uniforms for the French Army. But the fears of the tailors could not be quieted and the machines were destroyed by a mob. Sometime between 1832 and 1834 Walter Hunt a New York inventor produced a sewing machine that made a lockstitch. The machine used an eye-pointed needle carrying the upper thread and a shuttle carrying the lower thread. It represented the first occasion an inventor had not attempted to reproduce a hand stitch. The feed let the machine down – requiring the machine to be stopped frequently and reset up. 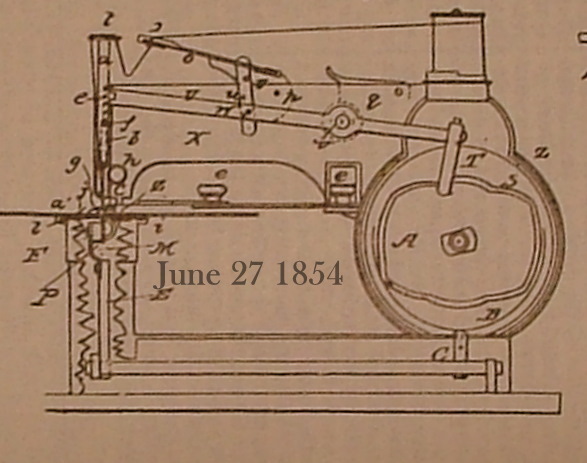 Hunt eventually lost interest in his machine and sold the patent. Elias Howe, Jr. was born in Spencer, MA to an impoverished family. He had to work at a farm during most of his childhood. At the age of sixteen he moved to Boston and started working as a machinist. After he married, he quit work due to a chronic illness, and his wife took in sewing to support the family. Seeing his wife toiling at her stitches and seeing his family at the edge of poverty convinced him of the need for a sewing machine. After watching his wife for hours at a time and trying to duplicate the motion of her arm, he completed a machine in 1845. The machine was set in a hall were five seamstress raced it. The machine finished five seams before any seamstress had completed one. After a lengthy stint in England trying to attract interest in his machine he returned to America to find various people infringing his patent. He eventually won his case in 1854 and was awarded the right to claim royalties from the manufacturers using ideas covered by his patent. Isaac Merritt Singer has become synonymous with the sewing machine. He was the eight child of poor German immigrants from New York. At the age of twelve he started working as a mechanic and cabinetmaker. Singer patented a type-casting machine for book printing and displayed it in a steam-powered workshop run by Orson Phelps. Phelps was involved in designing sewing machines; however, customers kept returning them because of faulty design. Singer examined the machines with the eye of a practical machinist. Singer suggested that instead of having the shuttle passing around a circle, the shuttle should move to and fro in a straight path. 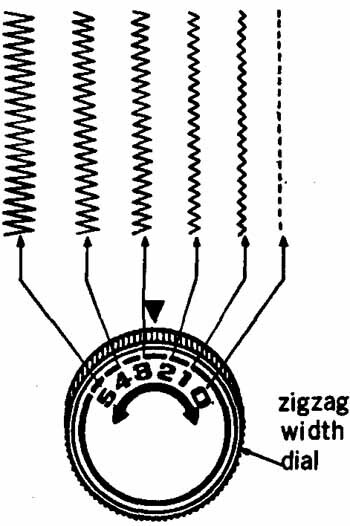 Phelps’ machine had a curved needle that moved horizontally; Singer proposed a straight needle to be used vertically. Phelps encouraged Singer to give up the type-casting machine and concentrate on the sewing machine. In 1851, Singer was granted an American patent for a sewing machine, and it was suggested he patent the foot pedal (or treadle) used to power some of his machines; however, it had been in use for too long for a patent to be issued. When Howe learned of Singer’s machine he took him to court. Howe won and Singer was forced to pay a lump sum for all machines already produced. Singer then took out a license under Howe’s patent and paid him $1.15 per machine. Singer then entered a joint partnership with a lawyer named Edward Clark and formed the first hire-purchase (time payment) scheme to allow people to afford to buy their machines. Meanwhile Allen B. Wilson went into partnership with Nathaniel Wheeler to produce a machine with a rotary hook instead of a shuttle. This was quieter and smoother than the other methods. The Wheeler and Wilson Company produced more machines in 1850s and 1860s than any other manufacturer. Wilson also invented the four-motion feed mechanism; this is still seen on every machine today. This had a forward, down, back, and up motion, which drew the cloth through in an even and smooth motion. 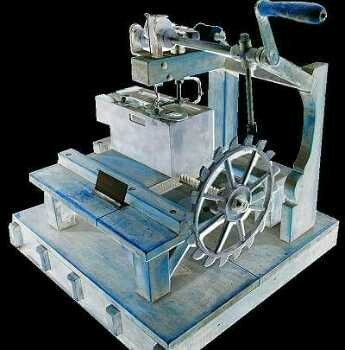 In 1855, James Gibbs, a 24-year old farmer, first saw a woodcut illustration of a sewing machine, and out of curiosity, he devised his own machine. Two years later, while visiting a tailor in Virginia, he noticed a Singer sewing machine, which he thought was too heavy, complicated, and exorbitantly priced. Recalling his own invention, he teamed up with James Willcox whose family was already involved in building models of new inventions. Together, they manufactured chainstitch sewing machines. The machines were sold for approximately $50. Similar machines sold for $100. 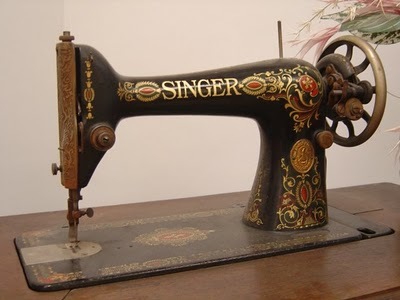 The Singer company then brought out their own light family machine in 1858, but it also sold for $100. 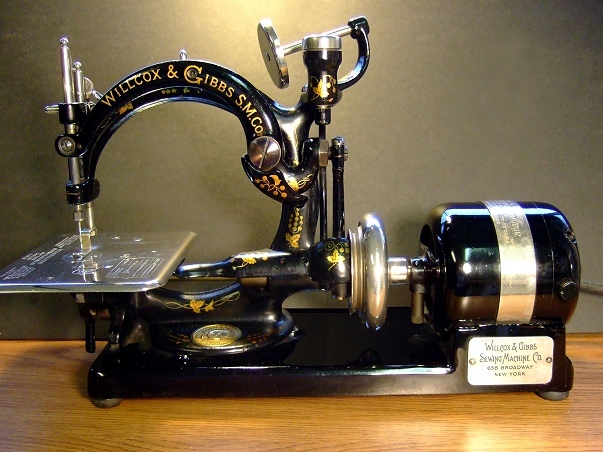 The Willcox & Gibbs Sewing Machine Company prospered and even into the 1970s was producing commercial machines, many of which were based on the original chainstitch principle. In 1885 Singer invented and patented the Singer Vibrating Shuttle, which made for a better lockstitcher than the oscillating shuttles of the time. Millions were produced until finally superseded by rotary shuttle machines in the 20th century. As intriguing as this statement is, we will never know if the credit for the first sewing machine should actually go to Elias Howe’s wife, Elizabeth Ames Howe. What we do know is that of the thousands of sewing machine patents granted in the past 150 years, hundreds of them have been by women. Notable among them is Helen Augusta Blanchard (1840-1922) of Maine. Of her 28 patents, 22 of them deal with sewing machines; she is particularly known as the inventor of the zigzag sewing machine. Sewing machines continued being made to roughly the same design, with more lavish decoration appearing until well into the 1900s when the first electric machines started to appear. 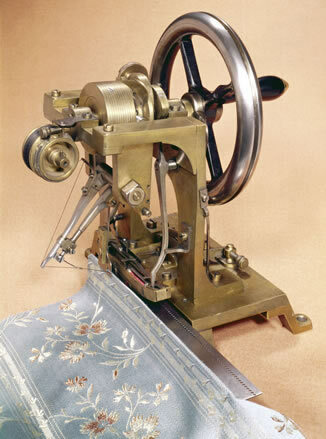 The first electric machines were developed by Singer Sewing Co. and introduced in 1889. Modern machines may be computer controlled and use stepper motors or sequential cams to achieve very complex patterns. Most of these are now made in Asia and the market is becoming more specialized. The sewing machine changed the life of millions of people, and it is bound to change mine. For now, I must wait to see if the electrical Kenmore 1803 made in 1973 is meant to be mine. Enough sewing machine obsession. I will be camping in Point Reyes and Mendocino through the rest of the week and the weekend.